MLS# 942147 - 1901 Bold Ruler Road, Albuquerque, NM 87123 - The FIRM Real Estate Group Inc. Welcome to Volterra!!! 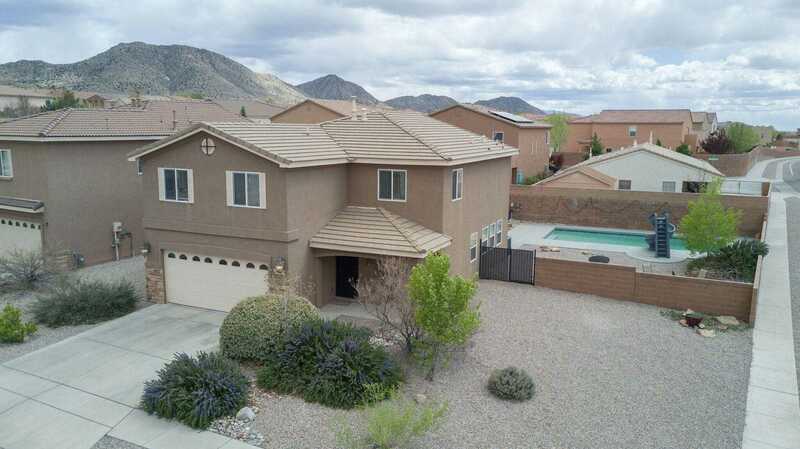 This home is 4 bedrooms, 2.5 Bathrooms, loft and 2 car garages. This home has been very well kept. Kitchen updates include lighting, granite counter tops, back splash, appliances. Upstairs you will find a loft perfect for a play area/office. The large master bedroom that has a walk-in closet and updated bathroom. Bedrooms 2 and 3 have views of the mountains, Bedroom 4 also has a walk-in closet. If you like relaxing, you will fall in love with this large landscaped back yard that has plenty of space to entertain. There is a covered patio, views of the mountains and you can’t forget about the refreshing POOL!!! The pool is only two years old and has a heater for year-round use. This is a no PID home. Close to Sandia Labs and Kirtland AFB. Schedule your showing today.